The New York Times has an excellent feature story about a pot grower in Oregon who tried to realize his dream of a country ganja farm but was stymied by skeptical neighbors. "He was sued. The neighbors also asked for a temporary restraining order to stop him from using a shared road to haul his products to market. When Mr. Wagner made a case for his processing facility at a county commission meeting in April, he was outnumbered by critics: 14 to 1." One of Wagner's most outspoken critics is a winemaker who got nervous about processing facilities when he read stories about butane explosions on the internet. Two other neighbors were "uncomfortable" when Wagner visited them to let him know about his new business; one of them said he was concerned about property values. The complaints about the road are strange; the winemaker cited traffic concerns, but since he likely wouldn't complain if the road was being used to ship more of his wine, it's pretty obvious that these concerns stem from the fact that Wagner is growing and processing weed. After news outlets picked up the story of the McMinnville pot feud, Wagner's neighbors began receiving angry and threatening phone calls. Predictably, that only made the winemaker and other neighbors more committed in their opposition to Wagner's farm. As is predictable when it comes to pot, there's a lot of misunderstanding going on here. On the one hand, the neighbors are clearly overreacting about the impacts of Wagner's farm, and they don't seem willing to understand and accept his crop of choice. On the other hand, the cannabis activists (cannactivists?) who made threatening phone calls were clearly out of line and made no attempt to understand the neighbors' concerns. For his part, Wagner did send friendly postcards and made visits to his neighbors to let them know what he was doing; however, the fact that he was coldly received and met with opposition does not automatically mean his neighbors are terrible people who deserve threats. 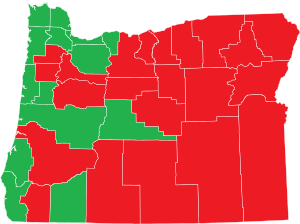 Counties in red, most of them rural, voted against legal MJ in 2014. All it signals to me is that it's going to take time for Wagner and his neighbors to understand one another, which is to say that it's going to take time for marijuana to integrate into mainstream agriculture. Many people in rural America are still opposed to marijuana - most rural counties in Oregon, Washington, and Colorado voted against their states' legalization measures - so cannabis activists should not expect farmers in these states to welcome marijuana farms with open arms. Cannabis activists need to recognize that just because they are turning the tide of public opinion, that does not give them a pass on trying to understand people's concerns about this new industry. Legitimate concerns - say, about an industry that is to-date cash only, or about chemical seepage or butane explosions - should be addressed positively and respectfully. Activists also need to know how to pick their battles. A dispute between farmers - however bitter it gets - is no call to crusade, especially since Wagner has not been banned from growing pot. The trick is to find common ground - a shared passion for agriculture, for example, or a shared concern for tight regulations on chemicals and other aspects of pot farming. The story of Richard Wagner is important because it is likely going to repeat itself in many states that have legalized marijuana, as cannabis farmers try to blend in with mainstream agriculture and with the farmers next door who have yet to warm up to the nation's largest cash crop.